The Mantis' Quill: Alrugo Films. WHOWHEREWHYHOWWHATPIZZA? For those of you whom may not be aware, Alrugo Films is a super team force production squad. Much like power-rangers really, but with less zords and more cameras and headphones (CameraZord being sent back through time via giant hammer nnnnnNOW). 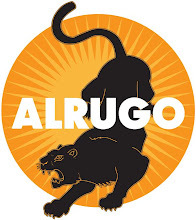 Alrugo is a bunch-o-people hellbent on bringing classiness and style back to the interwebs, even if it has never been here in the first place. We are writers, we are directors, we are actors, we are artists. We are of the new generation and we are all those terrible words the older generation use for us; hip, kookey, cutting-edge etc. All that malarky. Hip still is a fantastic word though. In essense, Alrugo is friendship, condensed into artistic endeavor. We are all the dearest of friends, and we all have such a similar sense of humour cultivated in our joint passage through life, that we need to express it through the medium of our choice and expertise. We intend to constantly provide you with that which you have (perhaps unknowingly) been missing so much in terms of contemporary media. We are not reality TV, we are not Hollywood, we are not CGI, we are not a seasoned yet out-of-touch pro director turning out 5 very late and ill-advised sequels in order to capitalize on our legend status forged by past works of genius. We are young, we are committed, we are passionate and we are going to show you ALL an extremely good time. Wow. I'm an aspiring film maker and I have to say, the Italian Spiderman is pure genius. Just everything about it, from the jokes, to the directing, to the cutting, is just perfect. Please keep making these. They are amazing. You guys have excelent sense of humor !!!!! WE received huge amount of pleasure :) !!! It's a best movie i ever seen.. waiting for second part!